Driven by enthusiasm, KJUS Sportswear relentlessly pursues magic under the midnight sun at Lofoten Links in Arctic Norway. The pioneering Swiss sportswear brand KJUS began as a skiing outfitter in 2000 and first applied its innovative technologies to the golf course in 2012. Driven by an enthusiasm for sports and an uncompromising fashion vision, the KJUS team selected Lofoten Links in Arctic Norway, as the location for the Spring / Summer 2018 Golf Collection photo shoot. The spectacular 18-hole Lofoten Links course is situated on the remote and rugged coast of Gimsøya in Lofoten, one of the most northern golf courses in the world, located 100 miles outside the Arctic Circle. Boasting an unobstructed view to the North and facing the midnight sun, Lofoten Links is one of the best places in the world to witness the magical and majestic Northern Lights. Planning their visit in September 2017, the team knew it would capture some stunning daylight images of the course. They also hoped they would get the unique chance to experience golf under the Northern Lights but with Mother Nature, there’s no guarantee. Equipped with specialist photography and video camera equipment the team set off on their adventure with high hopes and crossed fingers. Setting up a photography shoot with the Northern Lights was a gamble – the first hurdle was whether she would show up at all and the second was whether the crew could capture her on camera. Despite her unpredictability, luck was on their side. During the short stay on Lofoten Links, Aurora showed up three consecutive times for the KJUS golf wear shoot. Capturing her on camera was challenging, the team had to react to sudden moments before she’d vanish again. The setup had to be quick with the two professional golfers; Emily Talley and Geir Ottar Askvik ready and waiting to strike the golf ball the moment she’d appeared which was difficult in the darkness. The team set out on its adventure to bring golf to the Northern Lights. Whether they found the magic or the magic found them, it was an unforgettable night. The stunning fashion photography by Jaanus Ree and behind the scenes footage captured what is believed to be the first golf photo shoot under the Northern Lights. “I’ve been very lucky to have traveled the world and played some incredible golf courses while on tour, but Lofoten Links was a completely unique experience,” said Emily Talley, former Ladies European Tour and LPGA’s Symetra Tour Player and model for the shoot. “Concentrating on hitting shots was incredibly tough when all I wanted to do was turn around and stare at the beauty of the Aurora. The whole team would be exclaiming “Wow! Look at that!” and I just had to continue holding my follow-through for 30 tormenting seconds until the photo was captured. Eventually, those seconds were up and it was my turn to enjoy the beauty of the Aurora and it was Geir’s turn to experience the emotional, fear-of-missing-out, trauma,” Emily concluded. “Beating balls into the magical endless void before such a backdrop was unbelievable. It was not easy to concentrate on your game. 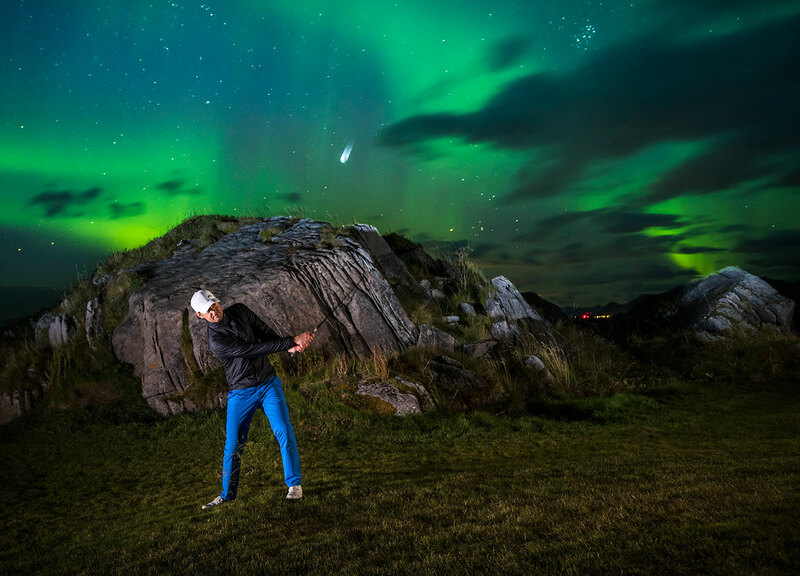 I’ve played some amazing courses through my career but this course was like nothing I have ever played, it feels like it is from another world; a fantasy course, especially when the Aurora showed up,” said Geir Ottar Askvik, the Golf Pro, and model for the shoot.